Read about how two UT Austin researchers have created synthetic, tree-like Surface Adhering Bioreactors (SABR), which could offer promising benefits for biofuels. 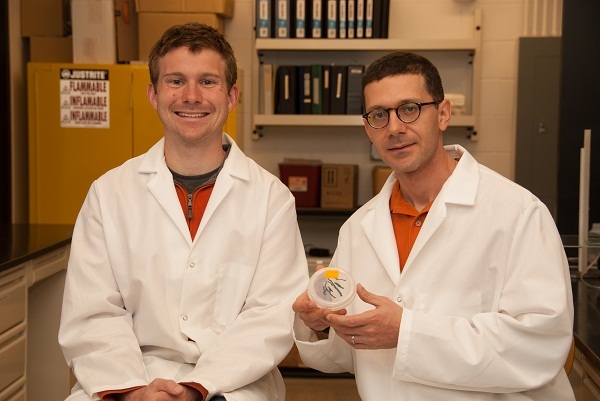 Two University of Texas, Austin researchers from the Mechanical Engineering Department, Thomas Murphy and Dr. Halil Berberoglu, have developed an innovative means to cultivate algal biofuels by utilizing a synthetic tree-like design. Although the logic behind microalgae-produced biofuel is simple, there remains a need to make the process of growing the algae and harvesting the energy dense molecules more efficient, especially in terms of water and energy consumption. Murphy and Dr. Berberoglu designed synthetic “trees” called Surface Adhering Bioreactors (SABR), which was patterned after the natural processes behind how trees deliver nutrients and transport sap. In this concept, algae cells are grown as photosynthetic biofilms on porous surfaces that keep them hydrated and provide them with the nutrients they need for growing to maturity. Once the biofilm is matured, the supply of certain nutrients is stopped and the growth of cells is inhibited. At this point, the algae are provided with the necessary inputs to carry on photosynthesizing and secreting out energy dense molecules, such as free fatty acids. These are carried away from the cells in small channels mimicking the veins in plants and concentrated using evaporation-driven flows. These concentrated energy-dense molecules can then be converted to a wide variety of biofuels. Once the algal biofilm reaches the end of its productive life over several months, it is removed, a new biofilm is grown to maturity, and the cycle continues. In this way, the available solar energy, water, and nutrients are directed more towards the production of fuel precursors and less towards growth, achieving a higher solar energy conversion and resource utilization efficiency. Murphy and Dr. Berberoglu’s team plans to present their findings for peer review next month. Click here to learn more about this study. Texas’ reputation as a leader in energy, together with the burgeoning biotech and research community, have helped to launch the state’s biofuel sector. This new discovery is yet one more example of how Teas continues to be a leader in biofuels.